NYC, 02/06/2019, 7:30PM. Works by J.S.Bach and more for cello and piano. Philippe Muller, cello; Alexandre Moutouzkine, piano. 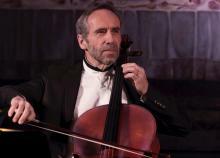 Cellist Philippe Muller formed a trio with Jean-Jacques Kantorow and Jacques Rouvier. Not only with this trio, but also with groups such as the Ensemble Intercontemporain, he has performed on the most important stages in the world. After thirty-five years of teaching at the Paris Conservatoire, he now continues his career as a professor at the prestigious Manhattan School of Music in New York City. Pianist Alexandre Moutouzkine has performed at the Great Hall of the Berlin Philharmonic in Brahms’ Piano Concerto No. 1 with the Berliner Symphoniker, a chamber music concert in Lincoln Center’s Kaplan Penthouse with the Jasper String Quartet. He performed with The Philadelphia Orchestra on its “Beyond the Score” series, performances in Colombia, a recital in Puerto Rico, and recitals throughout Asia, including appearances in the Beijing Concert Hall and Japan’s Yokohama Hall.